Q. Why should I give to The University of Winnipeg? People give to The University of Winnipeg for different reasons. Some give out of fondness for the university or their department. Others know the value of a UWinnipeg degree and want our university to remain one of the best in Canada. And others give because they realize that their education was supported by private donors and they feel a duty and desire to support current students. Q. The University of Winnipeg already has lots of money, why give more? The university is financially stable because generations of alumni and friends have given back to their alma mater. The university is able to continue its tradition of excellence and to provide more opportunities, not only because of past gifts, but because of new ones. UWinnipeg graduates make contributions in business, education, and the arts, just to name a few. A gift to the university supports the people and programs that enrich our communities and our world. Q. How much should I give to The University of Winnipeg? Any gift, regardless of the size, makes a difference in the lives of UWinnipeg students. For example, a gift of $3,500 covers a full year's tuition and fees for an inprovince student while $1,000 enables a graduate student to present his/her research at a conference and $100 can help a student purchase required textbooks. For your convenience, we accept one-time gifts and reoccurring credit card gifts. Q. Is my gift to The University of Winnipeg tax-deductible? Yes, gifts to The University of Winnipeg are tax-deductible to the extent allowable by law. You will receive a printed receipt for your records. First-time donors are eligible for a super credit for gifts $1000 and less. Click here for more information. Q. I understand that many companies will match my gift to The University of Winnipeg. How can I find out if my employer will match my gift and how do I go about it? To find out if your employer will match your gift, contact your Human Resources department. Once you have the matching gift form from your company, please mail it with your gift to the University. We'll handle the rest! Q. 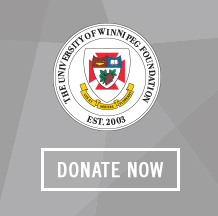 What is The University of Winnipeg Foundation's Charitable Registration Number? The University of Winnipeg Foundation is a Registered Charity recognized by the Canada Revenue Agency and our Charitable Registration Number is 86517 1045 RR0001. Q. Why should I give to the university when I work here? Giving is a personal decision and each person who gives has their own answer to that question. We have the privilege of working with students on a daily basis. In addition to our daily contributions of energy and effort, we also have the opportunity to do something extra to show that we are invested in the success of our university and our students. Tuition and provincial funding do not cover the entire cost to educate a student. Without the support of faculty and staff members, students would not have the support and resources they need like scholarship and bursaries, updated technology, or great programs and physical spaces. Faculty and staff gifts reach beyond their own dollar amount and encourage alumni, business and others to make gifts of their own. Making a gift, no matter the size, is just another way to show your support of our university. After all, it's our University and we have the opportunity to make it even better. To learn more about the importance of financial support, please click here. Q. Can I support a specific award, program or department on campus? Yes! You can designate your gift to any fund, department or academic program on campus that is important to you. You can even establish your own fund! If you want to support more than one area on campus, simply indicate those choices on your pledge form or our online donor form. Many faculty and staff choose to support scholarships and bursaries so that more students can receive a UWinnipeg education. Others give to the Library because it is a resource used by every student on campus. Q. What is the Campus Campaign? Faculty, Staff and UWinnipeg Retirees support students in many different ways by encouraging, supporting and mentoring them through their daily jobs and encouraging them to get involved and broaden their student experience. Support from the internal community makes a world of difference. Participation in the Campus Campaign is another way for us all to contribute to the student experience at UWinnipeg in a meaningful way. This year’s Faculty and Staff Campaign is centered on leadership. With the launch of the student call centre, it is important for our student callers to have the opportunity to tell our alumni that we have the support of our entire campus when they request support over the phone. While the campaign is aiming to raise funds to support our campus and our students, more importantly it is about increasing campus participation. Your participation in the campaign sends a signal to our alumni and the outside community that UWinnipeg is worth investing in. Whether it is $1 a day, $5 a week, a gift of $500 done through payroll deduction, there are an infinite number of ways for staff and faculty to contribute and to signal our belief in the UWinnipeg experience to others. Fill out the pledge form here [PDF] and contact Andrew Colvin, Communications and Annual Giving Officer, by email at a.colvin@uwinnipeg.ca or by phone at 204.988.7496 or donate online. The power of your gift will enhance the power of knowledge. To learn more about the Campus Campaign, please click here. Q. How does payroll deduction work? Payroll deduction is one of the fastest, easiest and most convenient ways to make a gift. When you complete the payroll deduction form, you can specify the amount you would like automatically deducted from each paycheck, the start date, and how you'd like your gift to be used. Each month you'll see confirmation of your gift on the deductions portion of your pay stub. For a breakdown of sample pledge amounts over 1, 3, or 5 years, please see this chart [PDF]. Q. Can I make a gift jointly with my spouse/partner? Yes! You can make a joint gift if your spouse/partner is an employee, an alumnus, or simply wants to participate in supporting The University of Winnipeg. Simply include his or her information when you make your gift. Q. What if my spouse/partner works for a company with a matching gifts program? Your gift may double or even triple if your spouse or partner's company has a matching gifts program. Please ask your spouse or partner to check with his or her human resources department for program specifics and paperwork or look here for a list of employers with gift matching programs and complete instructions. Q. I graduated from the university. Will my gift count toward alumni participation? Yes! Your gift counts even more because it counts as both faculty/staff participation AND alumni participation. Foundations and other charitable organization use participation when considering the university for funding and rankings. Q. How can I make a gift? Making a gift is quick and easy. If you would like to participate in the payroll deduction program, simply contact Andrew Colvin, Communications and Annual Giving Officer, by email at a.colvin@uwinnipeg.ca or by phone at 204.988.7496 to get started. Or, if you prefer to make a credit card gift, you are welcome to use our online donation page. For more ways to become involved, please click here. Q. I have other questions that aren't answered on this website, who can I contact? You can contact any one of our Foundation staff members, that's what we're here for! To start a conversation with one of us, click here and find the staff member you'd most like to speak with. Q. Who is making the phone calls that I receive about The University of Winnipeg? Currently enrolled University of Winnipeg students who are very knowledgeable about our campus. We give students valuable work experience, the opportunity to build communication skills, and a chance to get to know UWinnipeg alumni while giving you a chance to stay in contact with The University of Winnipeg. Q. What are you calling on behalf of? The Annual Giving Program calls for every department, college and academic program of UWinnipeg, as well as the President's Office and the Library. Q. I have degrees from both Business Administration and Sociology. Can I make gifts to both colleges at the same time? Regardless of how you are contacted, please feel free to make all of your gifts at the same time. Simply make a note on the gift or pledge form indicating how you would like your annual gift to be allocated, or go to our online giving page and select the area (or areas) you wish to support. Q. I made a gift in June and you are asking me to make another and it's only November. I thought this was the Annual Giving Program. The University of Winnipeg fundraising year coincides with the University's school year: September to June. Typically, alumni are asked to make their annual gift beginning in the spring or the fall. Please make your gift at a time that is most convenient for you. You can also make your gift online at any time or you can request to only be contacted at a specific time of the year. Q. Does The University of Winnipeg Foundation offer services to professional advisors? The University of Winnipeg Foundation works closely with all types of professional advisors, including lawyers, accountants and financial planners. We can help you design a charitable giving plan that is customized to meet your clients’ needs. We offer assistance with your research questions, sample language for estate plans and fund agreements. We can also make tailored presentations for you and your colleagues on giving strategies, and if requested, we are able to personally meet with you and your clients. Q. How do I get my clients started? For some initial information on charitable gift option ideas or to set up an appointment to discuss gift planning, please contact Brian Daly, President and CEO, by email at b.daly@uwinnipeg.ca or by phone at 204.786.9993. Brian will be pleased to discuss gift options and different fund types that best fit your clients' charitable interests and financial situation. A client may establish a named fund with an initial gift of just $2,500 or more. Q. How does The University of Winnipeg Foundation invest the assets of an endowed fund? The University of Winnipeg Foundation stewards the assets of the Endowment Fund based on a contributed capital model. Gifts received and endowed in perpetuity are permanently recorded as “contributed capital.” All assets credited to the Endowment Fund are invested on a pooled basis. Changes in overall asset value as a result of investment activity (after expenses are paid) are credited to the Endowment Fund Reserve. Q. Will I have to pay a fee to work with you? No. The University of Winnipeg Foundation staff welcomes the opportunity to discuss a custom-tailored charitable giving plan for your clients at no charge. Q. How can The University of Winnipeg Foundation fit into my clients’ estate plans? The Foundation will work closely with you and your clients to help facilitate planned gifts of all types. We have the expertise to assist with all aspects of charitable giving, including letters of intent around planned gifts and terms of reference for establishing a new fund. Q. Will The University of Winnipeg Foundation serve as an executor of a donor’s estate? No. Foundation policy does not allow us to act as an executor. We recommend donors appoint a qualified and capable organization or individual to administer their estate. We can work with you and your clients to develop a letter of intent as to how such a planned gift will be used.